Summers at Davenport Junior Theatre — the second-oldest children’s theater in the country, whose motto is “Theater For Kids, By Kids” — were a flurry of throwing younger children into bunny costumes, picking silly five-minute plays to perform in daycares and parks, making out in the hat closet, setting up and breaking down our traveling stage, collecting props while listening to Ben Folds Five, and, if my luck ran out, dressing up like a clown. 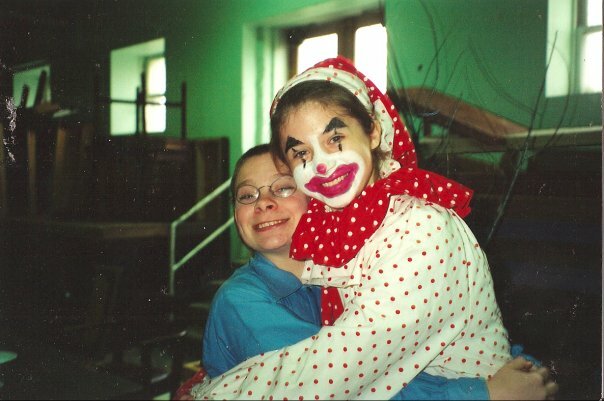 The red-and-white polka-dotted suit and stocking cap of the Showtime Pal costume fit nearly every teenager on staff, which meant we were all susceptible to dressing up like our theater’s bouncy mascot. To avoid clown duty, we’d all race to get to work on time; if I heard everyone shout “Hi, Showtime Pal!” when I opened the door to the office, I knew I’d lost. It was time to surrender my sensitive adolescent skin to a hot mess of cold cream, oil paint, and cheek-breaking smiles. Truth be told, I loved being Showtime Pal, even though summer sweat made my black triangle eyebrows drip down into my eyes, and even though the sheen of cold cream hampered my make-out prospects. After starting every performance with a reminder to “open your eyes and ears, close your mouths, and enjoy the show!”, I’d sit backstage and brainstorm intermission hijinks. Beyond the standard calisthenics and sing-alongs to “Do Your Ears Hang Low,” I couldn’t resist throwing in other bits, like eating out of Winnie the Pooh’s honey pot for an uncomfortably long time, cracking puns, and initiating spazzy dance parties. On the way home, in the passenger seat of the theater’s cargo van, I’d look out the window and alternate between waving at children in passing cars and staring dead-eyed at their parents. By the time I was old enough to dress up as Showtime Pal and teach classes of younger kids, I thought I’d already learned everything I could from DJT. But I’m sure the adults in charge of us all noticed what I couldn’t see at the time: Showtime Pal taught me how to improvise. I wasn’t always funny then, just as I’m not always funny now, but I’ve never since worried about looking foolish. After all, I haven’t just been a clown — I’ve also been a sweaty clown. Nothing can faze me now.